Always glad to share my trading strategies! Thank You Lianhe Zaobao for the Interview! 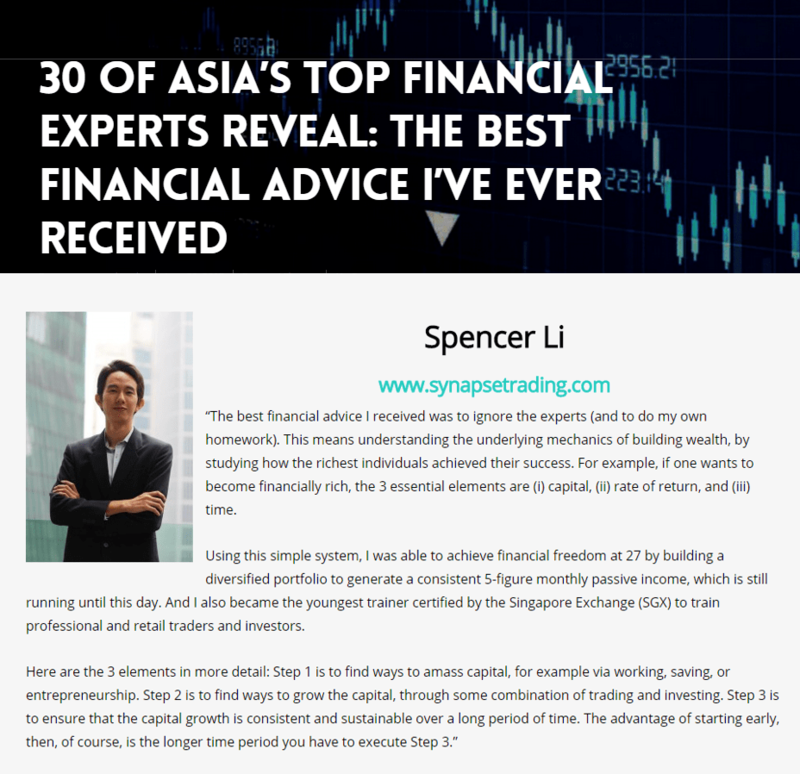 Last week, I got interviewed by the Lianhe Zaobao to share some of my market views, and also some basic TA knowledge. https://i0.wp.com/synapsetrading.com/wp-content/uploads/2016/06/2016-06-26-13.47.13.jpg?fit=1200%2C1499 1499 1200 Spencer Li http://synapsetrading.com/wp-content/uploads/2014/03/logo-header1.png Spencer Li2016-06-27 05:16:242019-04-06 16:43:48Thank You Lianhe Zaobao for the Interview! Thank You Straits Times & SMU for the News Feature! How time flies! In the blink of an eye, it has already been 5 years since I graduated from SMU with double degrees from the School of Accountancy (SOA) and the School of Business (SOB)! Once again, thank you Straits Times & SMU! https://i1.wp.com/synapsetrading.com/wp-content/uploads/2016/03/2016-03-11-18.39.13.jpg?fit=2832%2C2448 2448 2832 Spencer Li http://synapsetrading.com/wp-content/uploads/2014/03/logo-header1.png Spencer Li2016-03-14 03:48:502019-04-06 17:02:50Thank You Straits Times & SMU for the News Feature! 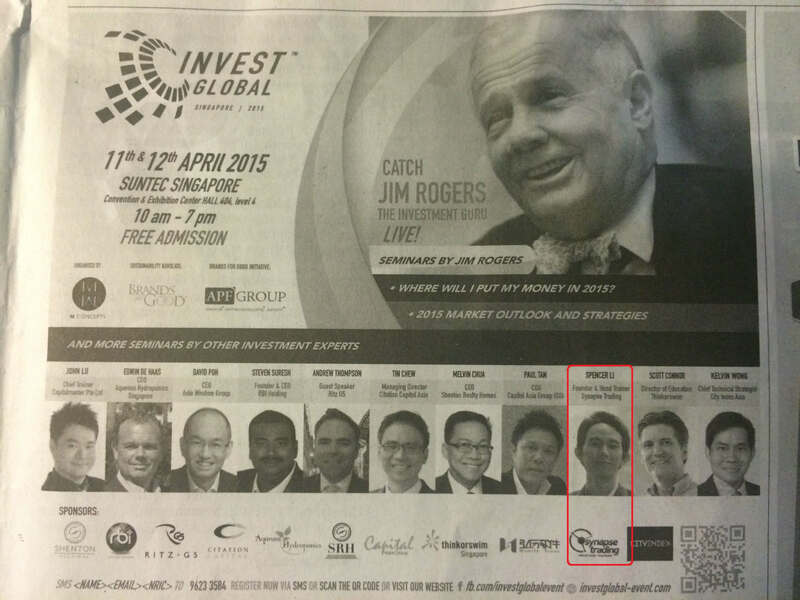 Invited to Share the Stage with Jim Rogers at INVEST GLOBAL 2015! As you enter the world of trading and investing, do you sometimes feel overwhelmed by the large number of different strategies and varied approaches? With the limited resources available, how can you maximise your capital to get both stable and aggressive returns, while keeping your risk low? In this seminar, we have simplified the trading & investing strategies used by professional fund managers, and how you can apply this systematic approach to building your wealth, and watch in amazement as your portfolio grows day by day, with little monitoring required. https://i0.wp.com/synapsetrading.com/wp-content/uploads/2015/04/2015-04-04-03.37.02-Copy.jpg?fit=3264%2C2448 2448 3264 Spencer Li http://synapsetrading.com/wp-content/uploads/2014/03/logo-header1.png Spencer Li2015-04-07 02:48:262019-04-06 17:26:06Invited to Share the Stage with Jim Rogers at INVEST GLOBAL 2015!